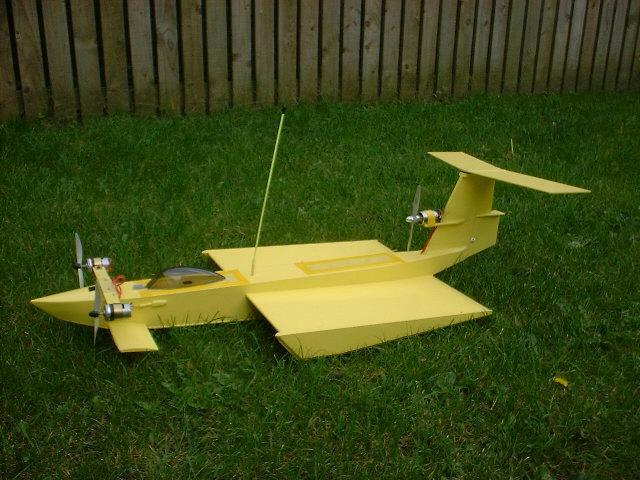 Plans pack to build WhizzyWig XGE - Download here!! 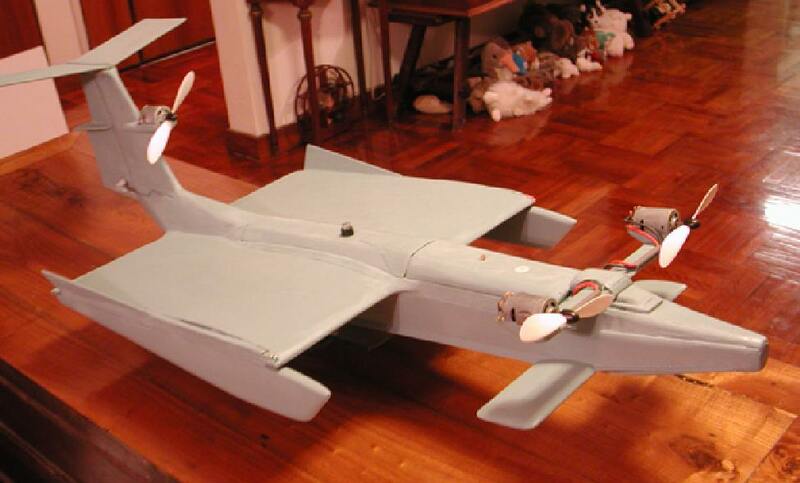 The Most Extreme Model You Can Make! 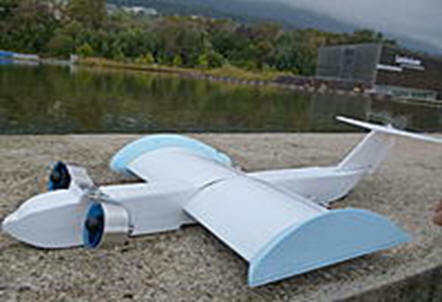 for construction from balsa, thin ply and foamboard. 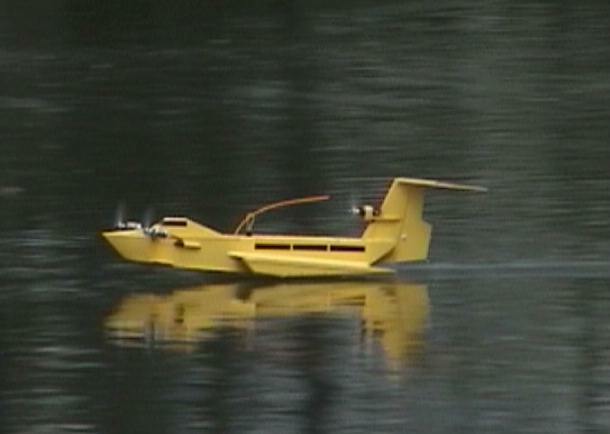 Some years ago I developed a Plans Pack for a radio controlled working model Ekranoplan - the 'WhizzyWig XGE' based on my MK4 & MK5 models. I am delighted to now make the Plans Pack free to download!! (**** donation gratefully accepted! *****). There is a lot of good stuff in the plans pack even if you don't built it. Great for school or university projects! 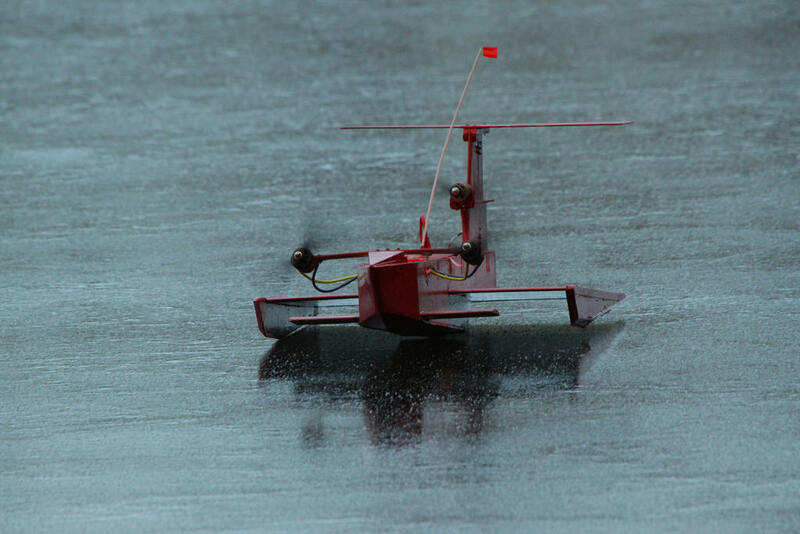 - Use WhizzyWig XGE to learn about boat, hovercraft and aircraft dynamics, and have fun at the same time! Displacement mode: High manoeuvrability and reliable steering control. 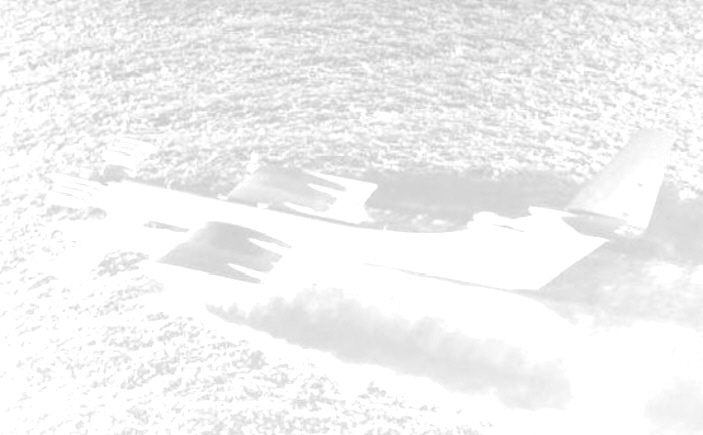 PAR mode for medium speed cruise and amphibious operation: The ‘power assisted ram’ (PAR) from its front fans gives fast take-off, enabling it to run over most smooth surfaces, including short grass, snow, ice, and especially water. 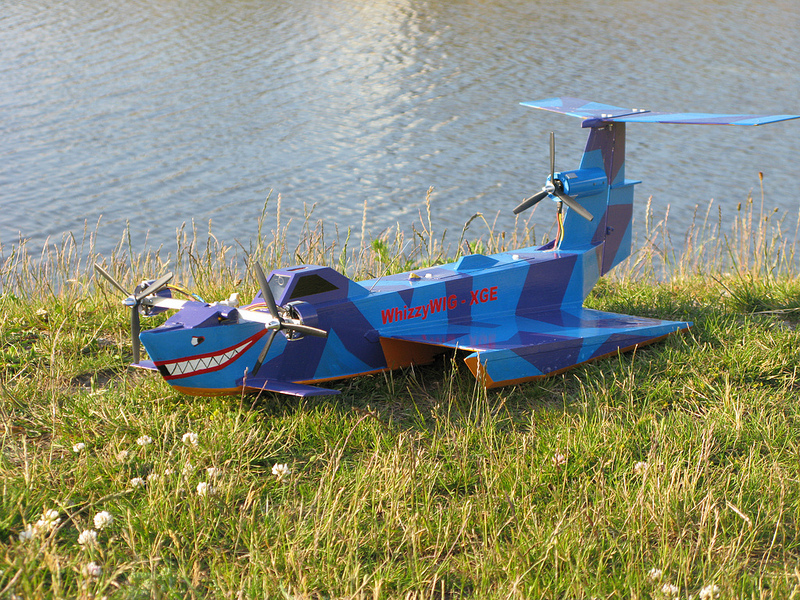 WhizzyWig XGE will even climb quite steep hills on grass or snow! In PAR mode WhizzyWig XGE is highly manoeuvrable. 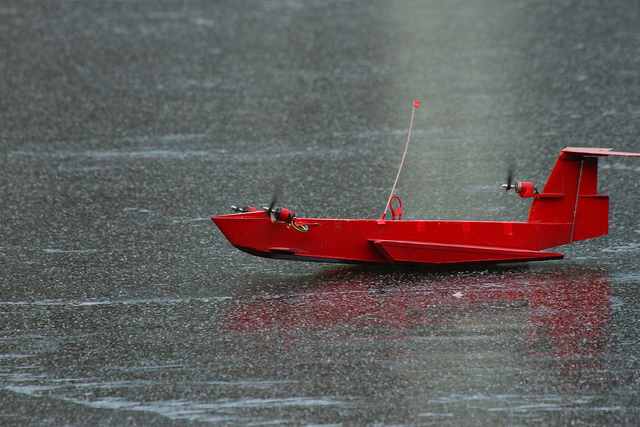 XGE mode: Full speed extreme-ground-effect flying over water, she runs like a drag boat but without touching the water! Donations will go to the cost of maintaing this site to make the plans pack avaiable in future. Once you have have gone though Paypal you will be taken to a page with the download link to the zipped file. 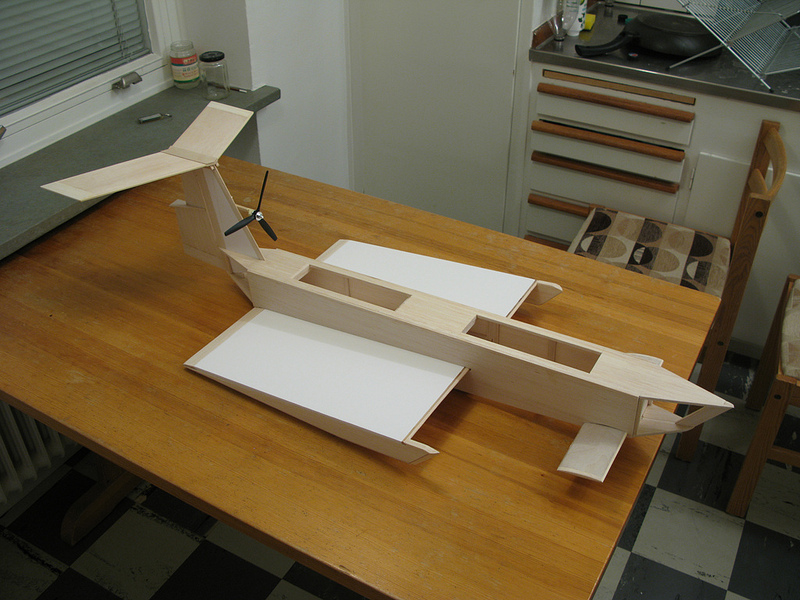 Spring 2005: Mickael Chazaux in France has made this model straight from the plans for a school project. 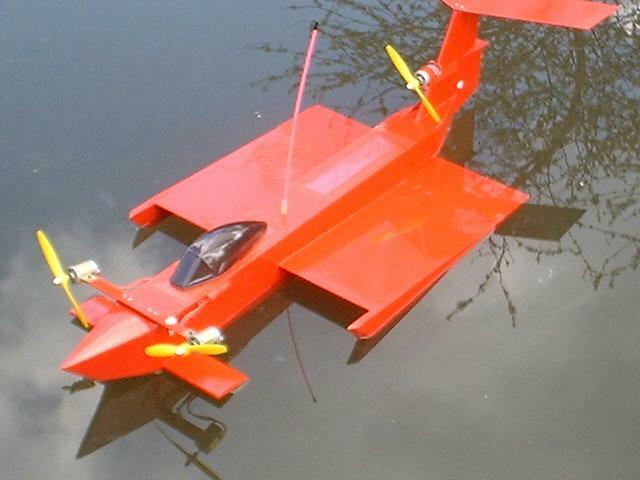 Spring 2005: Robert Love, Auburn University, Alabama, USA has built this WhizzyWig XGE for research as part of his studies for Aerospace and Materials Engineering Degree. 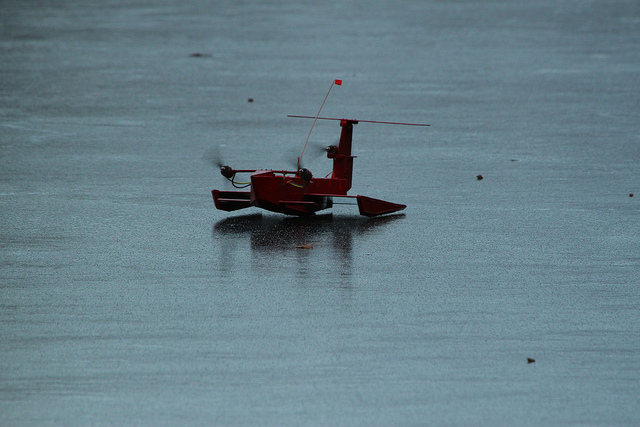 Here you can see the model is connected to a tether for closely controlled flight. See it in action. 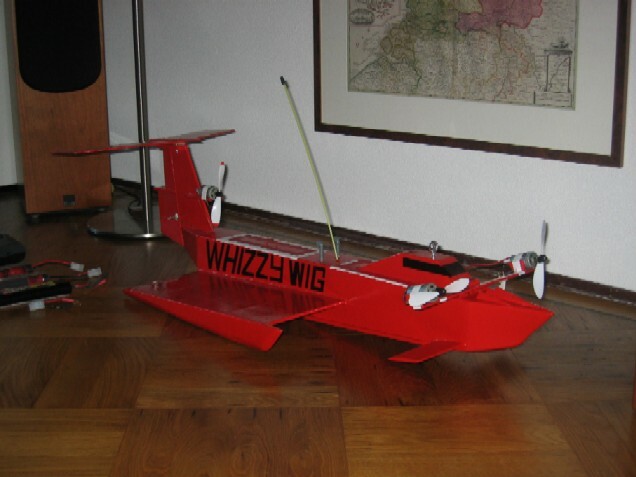 Another view of Robert Love's WhizzyWig XGE model. Keith Reed's WhizzyWig video action - undergoing trials over grass in Australia. Click photo to run video. 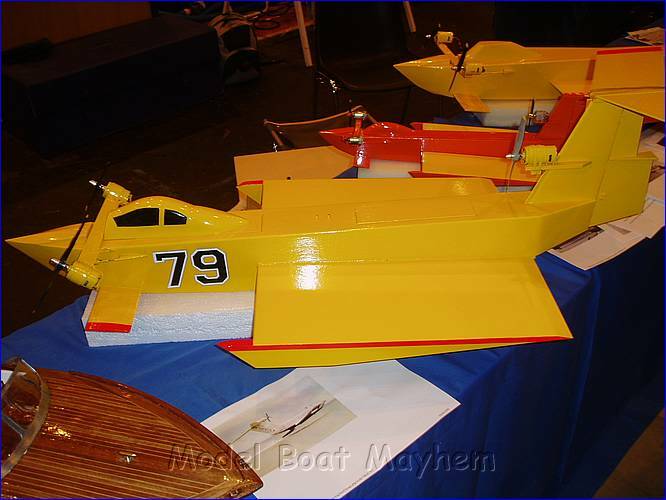 November 2002: Terry Elliot’s second model based on the WhizzyWig plans. 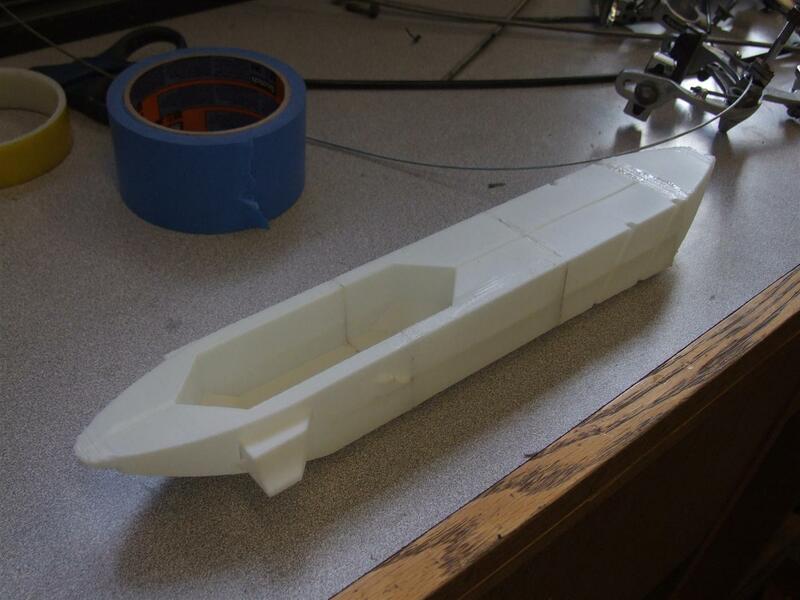 He says he has made a few modifications: the hull is 25 mm lower, it is much narrower at the bow and the stern, and the sponsons are shorter. 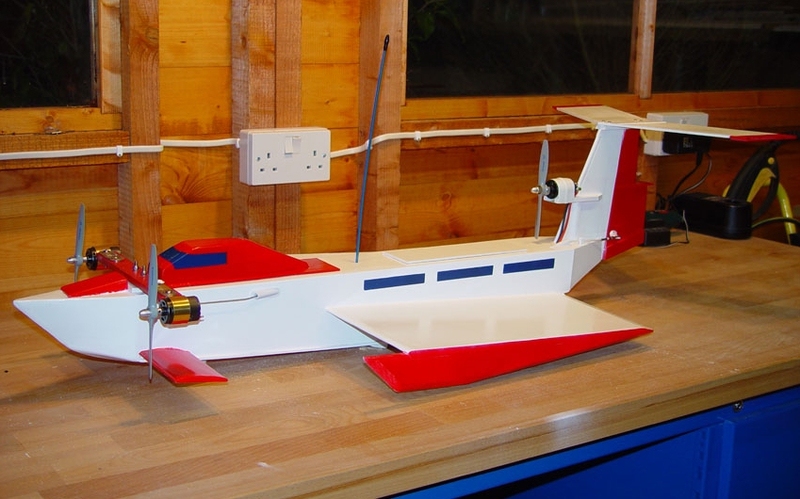 The battery sits in the hull below the wing to keep the c of g as low as possible and it weighs only 1450g. 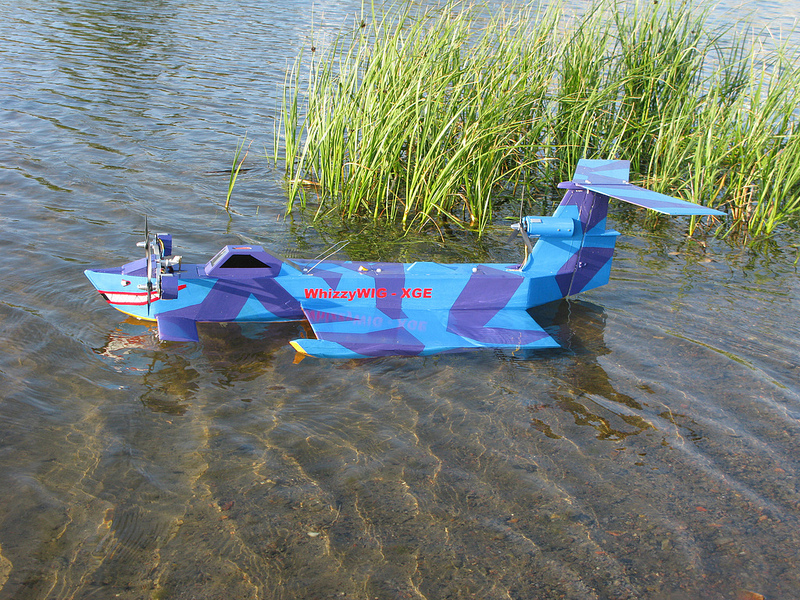 He has fitted a speed 400's on the front and a 480 on the tail. 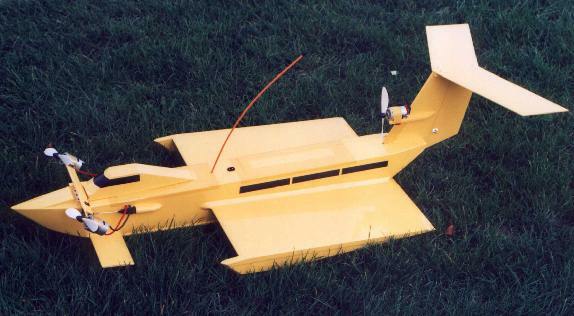 One of the first WhizzyWig XGE models to be built from the Plans Pack (- they only became available in December 2001). Terry's model reaches for the skies. Actually it was never designed to go that high! 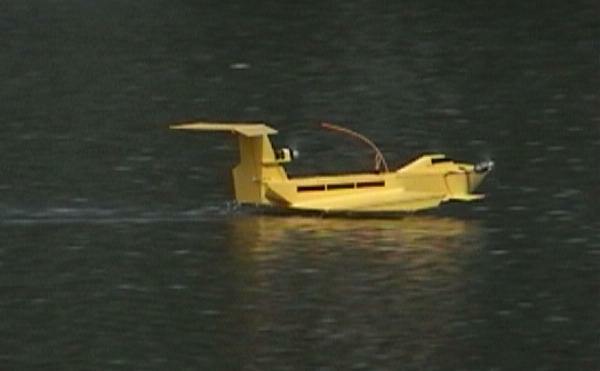 Alvin Cheung, in Hong Kong, adapted his WhizzyWig XGE plans to produce this very 'Caspian Sea Monster' like machine (April 2002). Marijn van de Ruit in The Netherlands built this beautiful model, seen next to his 1/144 scale plastic kit of the Russian A-90 Orlyonok ekranoplan. Some WhizzyWigs by modellers in France exhibited at the Paris 2006 Model Exhibition. Unfortunately I don't know who built these models. You can see there they come in different sizes. The one in the model is quite diminutive. 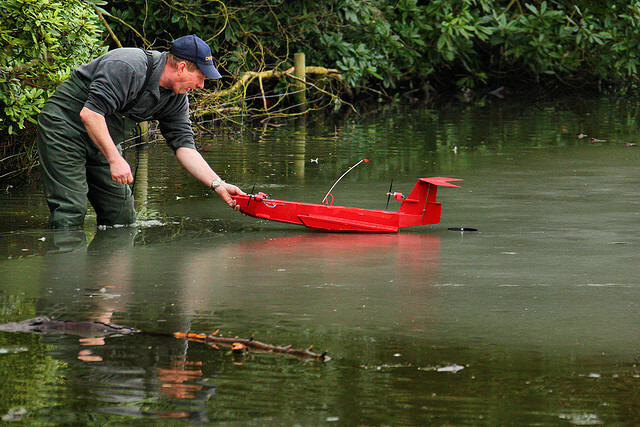 Hartsholme Electric Model Boat Club (HEMBC), Lincoln. Here are other people's models that are remarkably similar to WhizzyWig, although I don't know for sure just how much they were inspired by it.